Greg Zuerlein has kicked 14 field goals of at least 50 yards in three-plus seasons. 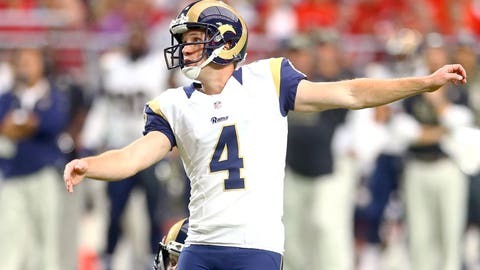 St. Louis Rams kicker Greg Zuerlein earned the nickname “Legaton” during his rookie season for his ability to connect from long range. Zuerlein nailed 7-of-13 attempts from midfield or beyond in his first year and entered his fourth season by converting on 13-of-22 from at least 50 yards. So Rams coach Jeff Fisher was not shy about sending Zuerlein out to attempt a 63-yard attempt late in Sunday's 24-10 loss at Green Bay. “I was down by 11, so I thought it was the right decision, plus I had a couple timeouts,” said Fisher, who also had Zuerlein attempt kicks of 50 and 53 yards. One was blocked and the other missed wide left. Zuerlein does have a career-best 60-yarder to his credit, so he didn't flinch when Fisher called his number from 63 yards – even though only six kickers in history have hit from that distance, with the record a 64-yarder by Matt Prater at altitude in Denver. “Not at all,” Zuerlein said per the St. Louis Post-Dispatch. “Every time Coach makes a call to kick I think that’s the right call. I don’t think the distance really matters. I’ve just got to go out there and execute, make it happen. Zuerlein misses the 63 yarder. Had plenty of leg. Greg Zuerlein just missed a 63-yard FG attempt to the left with the ball halfway up the uprights. That was a Janikowski-esque boot.